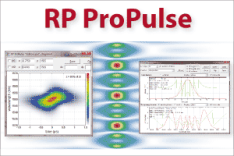 Ask RP Photonics for advice on designing your mode-locked laser, selecting the best mode-locking technique, etc. Additive-pulse mode locking [1, 2] (sometimes also called coupled-cavity mode locking) is a technique for passive mode locking of lasers (typically bulk lasers), used for generating short optical pulses with durations of picoseconds or femtoseconds. The general principle of additive-pulse mode locking is to obtain an artificial saturable absorber by exploiting nonlinear phase shifts in a single-mode fiber. The fiber is contained in a resonator, which has the same round-trip time as the laser resonator and is coupled to it with a semi-transparent dielectric mirror. The pulses returning from the fiber resonator into the main laser resonator interfere with those pulses which already are in the main resonator. For proper adjustment of the resonator lengths, there is constructive interference near the peak of the pulses, but not in the wings, because the latter have acquired different nonlinear phase shifts in the fiber. As a result, the peak of the circulating pulse is enhanced, whereas the wings are attenuated. Figure 1: Schematic setup of an additive-pulse mode-locked laser. The strength of the APM technique is that it makes it possible to obtain fairly short pulses without using very special optical components. It can also work in different wavelength regions. For these reasons, additive-pulse mode locking was widely used in the early days of passively mode-locked lasers; it was applied to various bulk lasers, color center lasers, and fiber lasers. However, the resonator length adjustment is usually rather critical, questioning the practicability of the technique for commercial products. In some mode-locked high-power lasers, additive-pulse mode locking was reported to be self-adjusting, but the exact mechanism does not seem to have been reported. 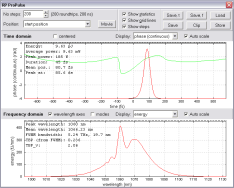 In some fiber lasers, APM has been reported to occur with self-matched resonator lengths due to an automatic adjustment of the oscillation wavelength . In fiber lasers, mode locking can also be achieved by employing nonlinear polarization rotation in a fiber. That method is actually related to additive-pulse mode locking, although an external resonator is not required. Two polarization modes, which are coupled with each other by nonlinear effects, are interferometrically combined at a polarizing element, where a similar interference effect occurs as in additive-pulse mode locking.